Last night, we went for a walk around the lake. Gorgeous. It was around eight so the tail end of the sunset was just visible on the horizon. Lights from the buildings on the edge were shimmering on the water. There was a slight breeze, gentle, and cool. In other words, a extraordianry late summer night in Minneapolis. Then this morning I awoke, nasal. Sneezing. Itchy eyes. Itchy throat. Even my eyebrows were itching! A full blown allergy attack. And it's all my fault. I had totally forgotten that peak pollen times are early in the morning and late evenings. My entire day can be ruined from an allergy attack if I don't take proper precautions, namely an allergy pill before bedtime. So mesmerized was I by the seemingly idyllic lake walk, that medicating was the last thing on my mind. Well I paid for that lack in judgement. All. Day. Long. Few things are worse that an allergy attack for me. On the up side, I discovered something about myself: even at my most irritable, I still enjoy cooking. My plan for today was: exercise, shopping, and baking. I cancelled the first two but, after taking zyrtec and being semi-unconscious until 2 pm, I made my best recipe for blondies. 2. Toast 1/3 cup of almonds and set aside. 3. Combine flour, almond powder, baking powder, baking soda, and salt. Set aside. 4. Using a hand held electric mixer, whisk together the ricotta and sugar, until light and fluffy, about one minute. 5. Whisk in egg, followed by sour cream, and almond extract. 6. Add flour mixture in two batches, whisking well between additions. 7. Fold in white chocolate chips and toasted slivered almonds. Pour into an 8x8 baking pan. Top with the remaining 1/4 cup untoasted almonds. Bake for 20 to 25 minutes until a toothpick inserted in the middle comes out clean. 8. Remove pan from the oven and place on a wire rack to cook for 15 minutes. 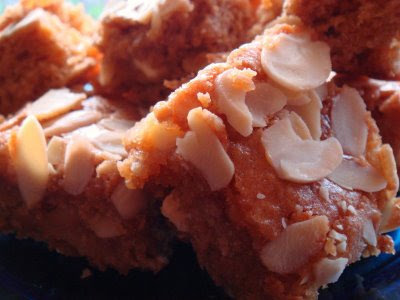 Cut blondie into squares and cool completely. Hi Natasha, I was going to make these, but noticed they have no sweetener or leavening listed. You mention sugar, baking soda, baking powder, and salt in the ingredients. How much of each is required? Thanks for bringing this to my attention. I must have been having one of those days. Anyway, it's fixed now. I think I'll be making this today as well. It's a rainy day here, so what better way to spend the day indoors than baking. Thanks again, and feel free to give me more feedback if you do make these. Hi Natasha - what's the yield of this recipe? Thanks!